Rebecca Schweiger owns and operates The Art Studio NY, New York City's #1 art school for all ages and levels. In her more than 10 years of teaching art to people from all walks of life, she has honed her ability to bring out the creative spirit, regardless of skill level or age. She firmly believes that everyone can tap into their creativity to make meaningful works of art. 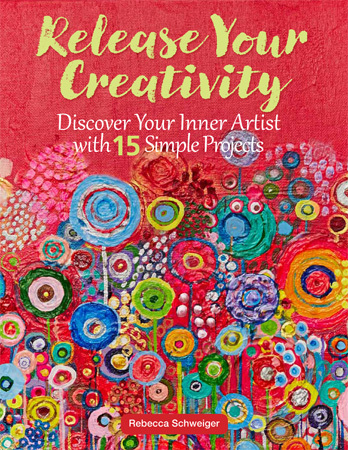 In Release Your Creativity, Rebecca teaches how to do just that with 15 step-by-step painting and mixed-media projects that are sure to get anyone's creative juices flowing-with no previous art experience required. These hands-on projects are more than simple how-tos; they are designed to explore one's individuality and singular point of view, so that each finished project is a unique expression of the artist who created it. With her warm approach and nurturing sensibility, let Rebecca Schweiger show you the thrill of putting paint on canvas and the freedom of releasing your distinctive creativity.